Hold Chloe Cow around 10 inches away from your baby's face and, after baby's gaze focuses on the toy, slowly move it from side to side. 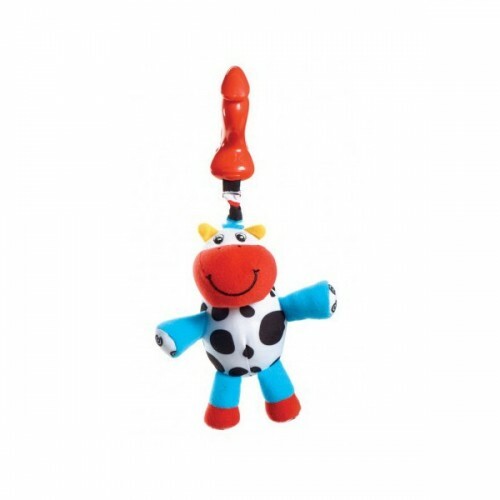 Baby randomly reaches out with her hand to touch Chloe Cow, causing the toy to swing and make pleasing rattle sounds – a captivating effect that encourages her to try again. Baby’s grasp reflex disappears and her control of her hands improves, allowing her to reach out confidently to pull the toy and make it jitter. 1.Use the clip to hang Chloe Cow on your baby's infant seat. 2.Hang it on baby's stroller as an on-the-go toy. 3.Place it in baby's crib for fun and play indoors. Chloe Cow's textures and contrasting colors, along with the large, smiling face that appears on it, provide rich sensory stimulation that encourages baby's sense of sight. Small enough to take anywhere, it stimulates your baby to use her fingers and hands in a variety of ways, thereby helping enhance her fine motor skills.